"I perhaps owe it to flowers that I became a painter." This quote by Monet, hanging near the start of the exhibition, to me sums up the beauty and versatility of flowers in their various stages of growth and decay, their shapes and colours changing throughout not only their lifecycles but also the seasons and impacted by their surroundings. I can be appreciative of a delicate petal or stunning pop of colour in the landscape at the best of times, but never more so when seen through the eyes of far more perceptive people than myself; artists. Spanning the early 1860s to the 1930s, the exhibition at the Royal Academy of Arts is an exemplary collection of works showing the incredible versatility and observational skills from Monet and his contemporaries as they each depicted the most fascinating of glimpses inside gardens across the world. The centre piece of the collection is Monet's study in water lilies, which ranged from a very soft and mystical, almost fairytale portrayal of the famous view in 1903 to a far darker insight, such as the below paining from over a decade later. The rooms were divided into clearly distinguishable sections, each focusing on a different aspect of the exhibition or artists. 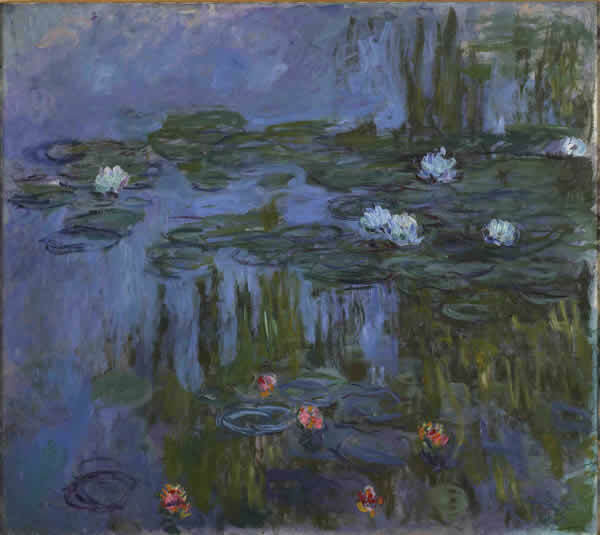 To me, the Monet paintings on display were the ones that instantly stood out, from the vivid neon and oranges in which he depicted the Japanese footbridge in 1865, right down to the hugely impressive Agapenthus Triptech (1916-1919), which shows the famous water lilies covering three walls in a single room – the clear showstopper at the end of the exhibition. But I don't want to dismiss Monet's contemporaries, as there was a remarkable selection of paintings on display that had an almost invisible pull on me; from Gustave Caillebotte's Nasturtiums (1892) featuring a soft pink backdrop with striking green and red flowers popping off the canvas, to Alfred Parsons' Orange Lilies (1911), from which you can almost smell the beautiful flowers scenting the air. And from the fiery, luminous trees of Santiago Rusinol's Glorieta VII (1919) to Henri Le Sidaner's The Rose Pavillion, Gerberoy (1936-1938), which is a picture-perfect snapshot of densely grown bushes of roses on a summer's day. You don't have to be an avid lower of flowers or gardens to be appreciative of the diverse talent on display in this exhibition. There is something interesting for everyone to explore, not in the least the fascinating journey in Monet's own life and discovering how his style and his view on the subject he studied so intensely for so many years changed over the course of his life. Painting the Modern Garden: Monet to Matisse will be at the Royal Academy of Arts until 20 April 2016 and you can buy tickets here.